It rained all night long. In the morning, I put all my heavy motorcycle gear on under the boughs of a tree. This was an attempt to minimize how wet I would actually be when I was finally riding down the road. Even though I had heated gear, it was cold. The temps dropped to the low 30s during the night and we had frost on the bikes. I slept cozy in my down bag, silk liner and knit hat, but riding nonstop in the rain was today’s forecast. I did have trouble putting on my contact lenses. The rain was bad enough that any chance of getting them in correctly was non-existent. I rode with my eyeglasses to the first stop and took care of the contacts in the restroom. Eyeglasses add an extra surface for potential fogging when cold. 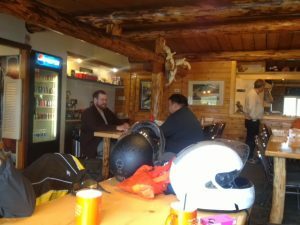 We made it to the Maclaren River Lodge for more hot chili and bread. I purchased a beer glass from the bar with the intention of packing it home, but I left it on the table. The lodge was filled with people in warm gear and hats, mostly hunters taking refuge from the rain. We saw several successful hunters throughout this trip; they had caribou parts tied to their vehicles for the long ride home to the freezer. 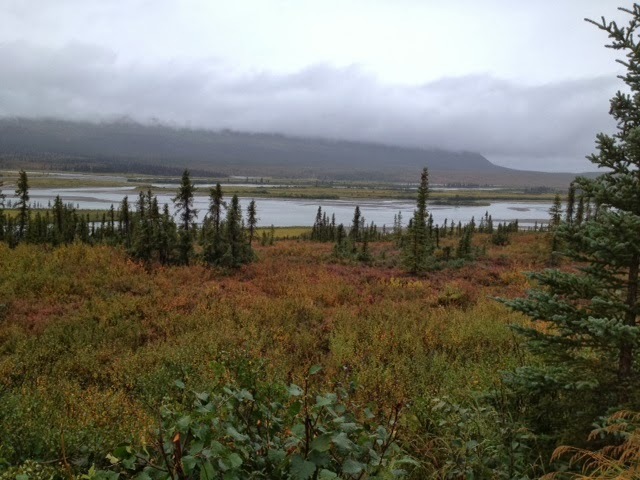 The view was clouded over in the distance, but the shades of red were apparent in the tundra close by. We pulled over to take a snapshot of the fall scenery and Diane became tip-over #2 on this trip. She had parked on a slanted section and didn’t realize the bike was still in neutral. Between the uneven ground, the extra gear weight, and the bike not in gear, she went over. It took only a second to right the bike. Both Michael and Diane looked at me and told me I was next. I made sure I was extra careful where I parked for the rest of the trip. 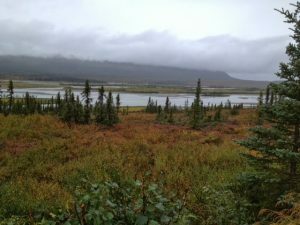 Although it rained the entire weekend, the fall colors across the tundra were beginning to show. 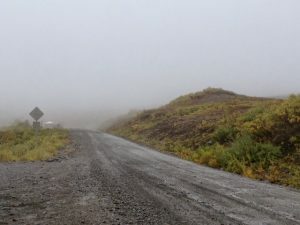 The road is relatively flat and, even with the rain, not much of a challenge. 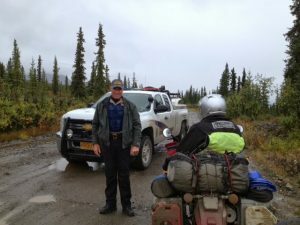 I knew there would be one section of glacial silt on the highway, but other than that area, the Denali would give us a scenic but non-technical experience. 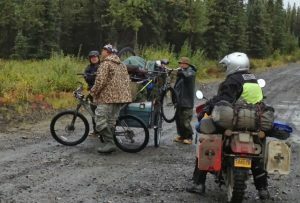 Knowing this would be the case, we planned to explore the Valdez mining roads near the Susitna River. If I am planning to ride around the world, then every opportunity to increase my technical skill is a good thing. All of this rain had flooded the secondary streams and smaller trails north. 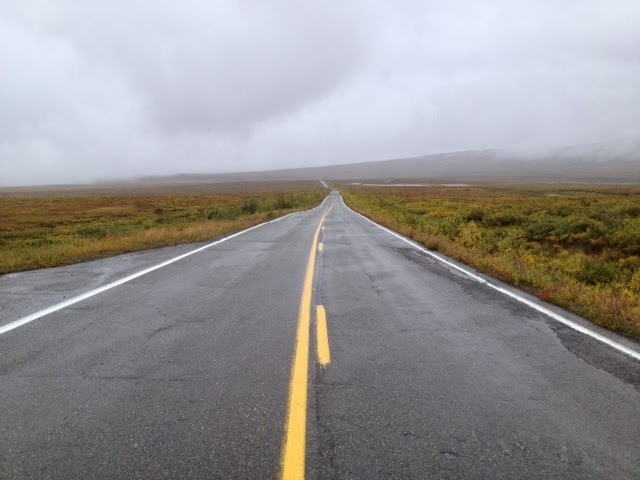 I did not think we could get back too far from the main road before we ran into the black mud that acts like grease (the same mud I ran into on the way to Inuvik the first time). If someone knows the story on this mud, please leave it in the comments section below. 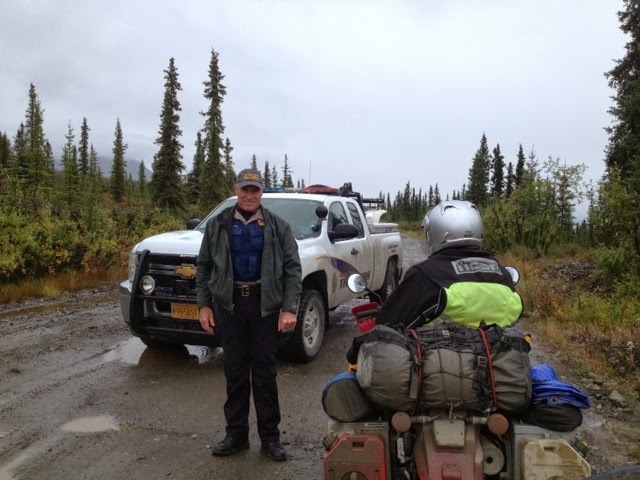 Either way, we were planning to only go so far up the Valdez Creek area. We started up with plenty of opportunities to test our water-crossing skills. We all did fine. Michael and I were riding tires a little bit more aggressively than Diane, but she did pretty good with her road tread in the mud. 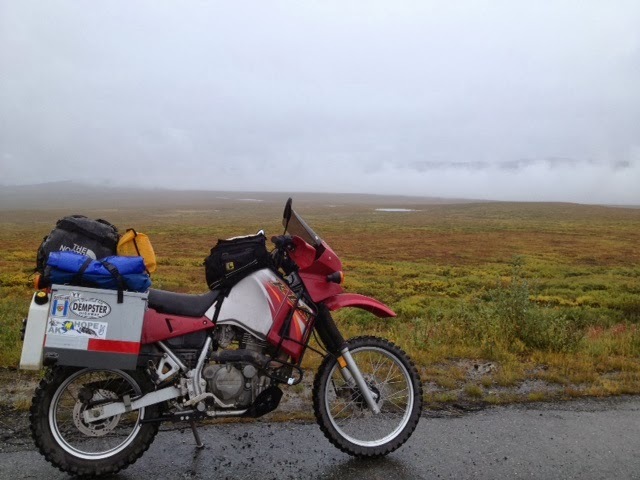 She slipped a little in the glacial silt on the main road later in the day, but still the tires did okay, and these were pretty wet conditions. While out in the middle of nowhere, sure enough, we get pulled over by a cop. This time it was an Alaskan State Trooper. He was concerned we were illegally hunting while using a motorized vehicle. 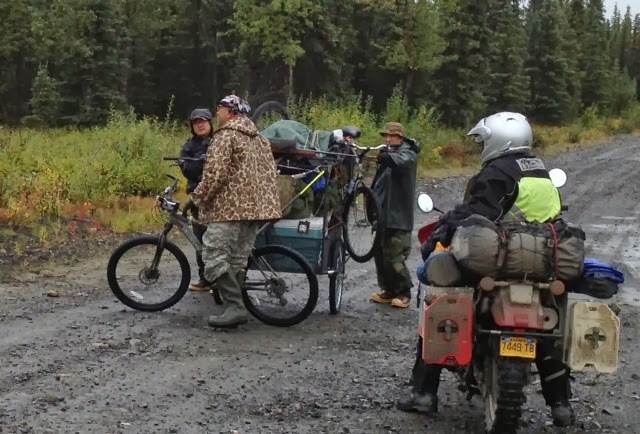 We chatted with him for a while and, when he realized that we had no intention of tying a caribou trophy rack across our handle bars, he waved us on. We topped off the water riding with a stop at the Sluice Box Bar at Gracious House for hot coffee. 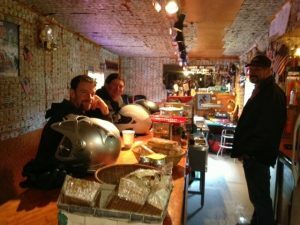 Michael and Diane enjoy coffee in a trailer converted into a bar. After Gracious House, we hit the glacial silty section of the road. The rain made it a little unnerving, but all you can do is just look forward and ride it through. This section is an esker; a sinuous ridge of silt, sand, gravel, and cobbles that were carried and deposited by a stream that flowed within the glacier and was confined by walls of ice. When the glacier melted away, these deposits were left as elongated mounds. Eskers along this highway are some of North America’s outstanding examples of this type of glacial feature. They are also difficult to pedal or motorcycle through. It is a small section, but be careful. We had planned on camping at the last campground on the highway, but it was packed due to the hunting season. We pressed on to Cantwell and spent the night there. I love the Denali Hwy but during hunting season, I avoid it. I never wanted to ride a motorcycle in Alaska I must admit. Too goddamned cold, especially now that I have spent the past 4 winters in Thailand. You are braver than me. 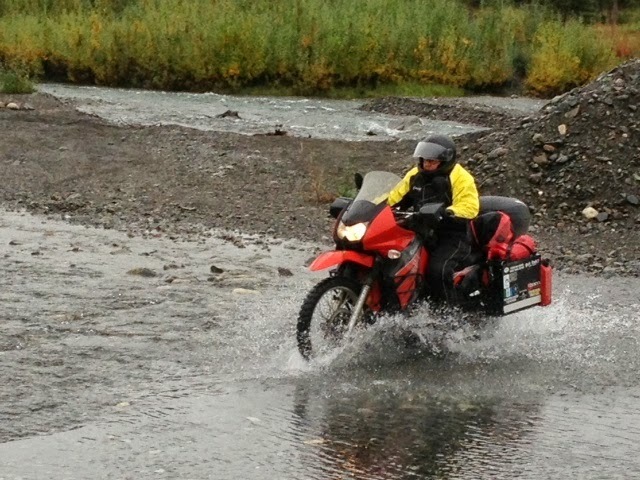 I reckon the KLR is a good choice for what you're doing although I've never ridden one. Best of luck in your travels.